Description The clear, accessible guide to the only medically proven programme to treat IBS, The Complete Low-FODMAP Diet introduces this cutting-edge approach for the first time. Author Biography Dr Sue Shepherd (Author) Dr Sue Shepherd is an Advanced Accredited Practicing Dietitian and Accredited Nutritionist specialising in the treatment of dietary intolerances. A coeliac herself, Dr Shepherd is the author of numerous peer-reviewed papers and is recognised internationally as an expert dietitian in IBS and coeliac disease. Dr Peter Gibson (Author) Dr Peter Gibson is Professor of Gastroenterology at Monash University and Director of the Department of Gastroenterology at the Alfred Hospital in Melbourne. He is recognised all over the world as an expert physician and researcher and was recently awarded the Distinguished Research Prize by the Gastroenterological Society of Australia. There are 32 items available. Please enter a number less than or equal to 32. Immediate payment of £10.93 is required. At last a book that really addresses the causes and problems of IBS etc. This has been a great help full of relevant information. The things that I have noticed immediately what the easy writing style and the really nice and clear photos. I initially though the food and diet were going to be horrendous but the recipe section is really interesting with the wide variety food stuffs that you can eat I'm only just starting with this change of life style and it is showing improvements after just a few days. I will be getting the updated edition as soon as I've finished working through this one. 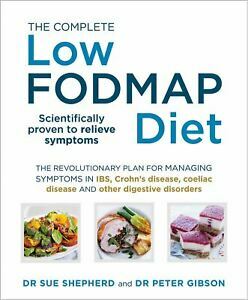 Just being told you need to start a low fodmap diet is quite challenging but this book explains things really well. Having the recipes in the second half of the book is brilliant and I shall be making use of that in time. These books are so good ,they have made my life easier.I'm very sensitive to a lot of the foods so it was really good to find a book that I don't have to take out ingredients . Very well written and explanation of diet is well done. Very easy to follow hence good results from diet.